A controversialist and physician in ordinary to King Alfonso VI. of Castile; born at Huesca, Aragon, in 1062, and died in 1110 at the age of forty-eight. He embraced Christianity and was baptized at Huesca on St. Peter's day, June 29, 1106, in his forty-fifth year. In honor of the saint and of his royal patron and godfather he took the name of Petrus Alfonsi (Alfonso's Peter). Like all the apostates of his time, he sought to show his zeal for the new faith by attacking Judaism and defending the truths of the Christian faith. He composed a series of twelve dialogues against the Jews, the supposed disputants being Mose and Pedro (= Moses Sephardi and Petrus Alfonsi, or, in other words, himself before and after conversion). Though the work is overpraised by Raymund Martin, in his "Pugio Fidei," and others equally biased, it is but little known to-day; and, as Steinschneider observes ("Hebr. Uebers." p. 933), fully merits the oblivion into which it has fallen. The "Dialogi in quibus impiæ Judæorum . . . opiniones . . . confutantur," the full title of which is given in Wolf, "Biblioteca Hebræa" (i. 971) and Fürst, "Bibl. Jud." (i. 36), appeared at Cologne in 1536 and later in "Biblioteca Patrum" (xii. 358, xxi. ; ed. Lugdunensis, p. 172; ed. Migne, t. 157, p. 535). Other books are ascribed to him, and he is sometimes confounded with Petrus Hispanus of the thirteenth century. See Steinschneider (l.c. p. 470, § 282; p. 934, § 557, note 208), who regards him as the probable translator of the "Canones Tabularum" ("Cod. Corp. Chr." 283, 13; f. 141b) from the Arabic. It is ascribed to one Petrus Anfulsus, who is very likely identical with Alfonsi (see Steinschneider, "Hebr. Bibl." 1882, xxi. 38; "Hebr. Uebers." pp. 985, 986, § 589). Another controversial tract, described as a dialogue "Inter Petrum Christianum et Moysem Hæreticum" (Codex Merton, 175b, f. 281; in Coxe's "Cat." 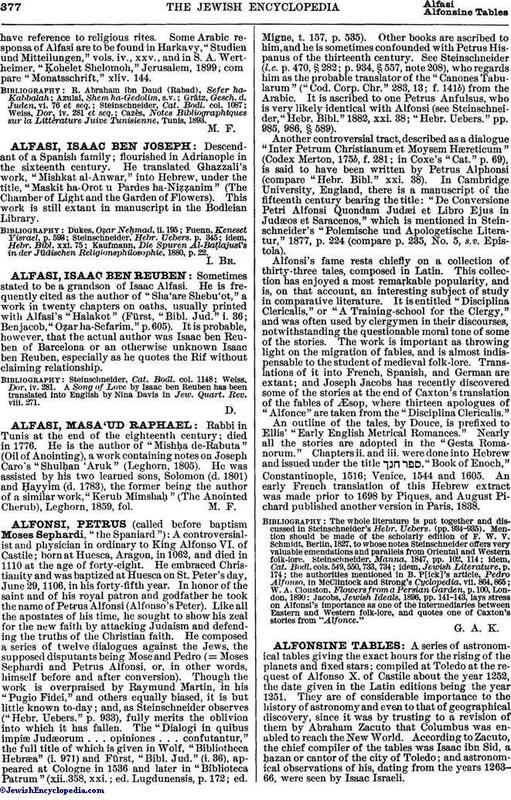 p. 69), is said to have been written by Petrus Alphonsi (compare "Hebr. Bibl." xxi. 38). In Cambridge University, England, there is a manuscript of the fifteenth century bearing the title: "De Conversione Petri Alfonsi Quondam Judæi et Libro Ejus in Judæos et Saracenos," which is mentioned in Steinschneider's "Polemische und Apologetische Literatur," 1877, p. 224 (compare p. 235, No. 5, s.v. Epistola). Alfonsi's fame rests chiefly on a collection of thirty-three tales, composed in Latin. This collection has enjoyed a most remarkable popularity, and is, on that account, an interesting subject of study in comparative literature. It is entitled "Disciplina Clericalis," or "A Training-school for the Clergy," and was often used by clergymen in their discourses, notwithstanding the questionable moral tone of some of the stories. The work is important as throwing light on the migration of fables, and is almost indispensable to the student of medieval folk-lore. Translations of it into French, Spanish, and German are extant; and Joseph Jacobs has recently discovered some of the stories at the end of Caxton's translation of the fables of Æsop, where thirteen apologues of "Alfonce" are taken from the "Disciplina Clericalis." An outline of the tales, by Douce, is prefixed to Ellis' "Early English Metrical Romances." Nearly all the stories are adopted in the "Gesta Romanorum." Chapters ii. and iii. were done into Hebrew and issued under the title , "Book of Enoch," Constantinople, 1516; Venice, 1544 and 1605. An early French translation of this Hebrew extract was made prior to 1698 by Piques, and August Pichard published another version in Paris, 1838. The whole literature is put together and discussed in Steinschneider's Hebr. Uebers. (pp. 934-935). Mention should be made of the scholarly edition of F. W. V. Schmidt, Berlin, 1827, to whose notes Steinschneider offers very valuable emendations and parallels from Oriental and Western folk-lore. Jacobs, Jewish Ideals, 1896, pp. 141-143, lays stress on Alfonsi's importance as one of the intermediaries between Eastern and Western folk-lore, and quotes one of Caxton's stories from "Alfonce."